Interesting that nobody said anything before my review. It was creepy to hear the whispers speaking in the woods, while driving Rosita towards absolute madness and possible death in the hands of the faux dead. The dead hasn't suddenly developed an ability to talk. Instead, it's men wearing creepy skin costumes that somehow disables zombies keen senses for the dead. I didn't like the doctor talking Michonne down from her decision on not to trust to the young new comers. To be honest some of the look barely past 18, making them 10 years old when the apocalypse started. How could those young ones have survived all this time in the dead wasteland? Maybe they were saved by a number of miracles. However, I'm more likely ready to believe that they were attached to some group, maybe being even associated to the Whisperers themselves. So Michonne was right to deny them access to the Alexandria Safe Zone. In fact, in her shoes I would have done the same. I like that Jesus had taken the leadership over the Hilltop. He certainly is the right choice for being a smart guy. The only problem for him is that he likes to be a loner and the leaders cannot be loners, because they are needed by the community. You just cannot be as asbo as Daryl has become in his olden days. "When did you eat last time?" Carol asked. "Dog ate yesterday," was Daryl's reply. To be honest I think Daryl has lost more then a few screws during his isolation. Even Morgan gave up and found himself a group. Strange as it is that I consider Morgan saner of the two characters. The one person who I would have thought to be insaine was Aaron. Instead he seems to be the strongest one. He even had upgraded his hand to an armoured prosthesis. Why is that they haven't chopped off more arms and legs over the years to save people? The dead almost always go to bite arms and legs, instead of that torso one which eventually killed Carl. I was certain that Daryl was going lose his leg after he fell on his face in his pursuit to save the Dog. If Henry hadn't been there with his polearm, Daryl would have been a goner. 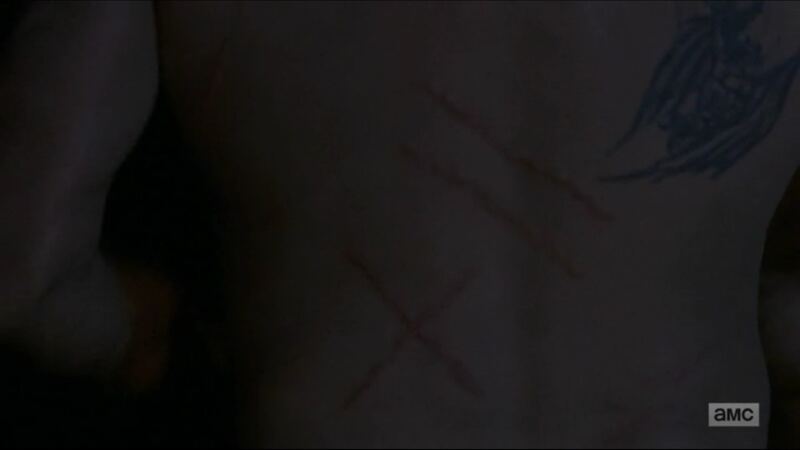 That X is the same one Michonne has on her back. It is under the kidneys so it cannot be the transplant thing. They simply don't have a surgeon who could have done the operation, not talking about a sterile room, power to run lights, extra blood supply and an ability to check the genetic match. If you get kidney problems at the aftermath of a zombie apocalypse, you are in BIG trouble. Henry checked it out, but he also shied away his gaze as if he knew the story behind it. But it is strange that he doesn't remember Daryl from six years ago. The biggest thing that TWD has brought up is the issue of culture via the destruction of the Stradivarius. Luke rightly pointed out that the culture brought the mankind together and it will make them better then the dead. Culture is a sign of strength that Michonne hadn't figured out. It is almost as if she has forgotten the days when she lived in the world of yesterday. Without the culture we wouldn't be together. We wouldn't had made anything without a culture. It is what separates us from the animals. Questions: what happened between Michonne and Maggie, and why Maggie went with Georgia? A note: there is one episode left before the mid-season finale. Will it be different than the previous ones? Are the scars some sort of ritual between Daryl and Michonne in memory of Rick? I hope we find out what the issue is with Maggie and Michonne , it's not Negan, it has to be something that happened after the bridge. Maybe Maggie thought she should have custody of Judith. Is it me or does Henry remind you of a knight's page. I'm finding him annoying. I like Luke, he has an innocence about him that even the younger cast members don't have. Maybe Alexandra should have an election. Michonne is obsessed, she feels to keep her family safe they need to remain isolated from the others, not good specially since those she needs to do this are in the other communities. Aaron may be the best candidate. I hope they don't kill dog. I hope we find out what the issue is with Maggie and Michonne , it's not Negan, it has to be something that happened after the bridge. Did they grow apart? Did Michonne tried to force her laws on Maggie? This older Henry is very different from that 10 year old boy. I also don't know Knight Page, who is he? He is like Jimmy from Fear. Both serve important function by providing the community a way to move forward. Will we have a band in this season if they find other instruments? I think music would improve their lives a great deal. Washington DC should have awesome record collections. So, if they could hook up in PA system with the record player they would be golden. Although at the moment with the Whisper influenced influx of walkers making noise might not be the best thing to do. Aaron may be the best candidate. I agree. He is most level headed of them all even though he suffered almost as much, if not more than Maggie. I was thinking of medieval/fantasy knights and their young apprentices. I think it is a little hypocritical of Carol to say anything to Daryl about wanting to be alone. She did it for several months, and Daryl was always a backwoodsman, even before the apocalypse. That is what he knows best. He has never been happy in group situations. The washed-out "bridge" is a little convenient to distance to two 'villages'. They never mentioned a bridge until it became a problem. On the other hand, we cross bridges everyday and rarely think about those either. However, the lack of fuel, and the slower progress by horse and cart makes the distance greater in any case without the need for the more obvious barrier. So, Rick's body has never been found! Surely, lots of bodies have never been found. What happened to the body attached to the foot that the dog had? They have never found Morgan's body. They have never found the trash-woman's body. People get eaten. Rick could have been washed out to sea, or eaten by the alligators. If Daryl is waiting to find Rick's body he will never be happy. For about 5 Seasons, I have wished that they got to the point where there were settled farming communities rebuilding some kind of society. Now that they have reached that point, I find it a bit dull. It is politics instead of warfare, and that is going to be very dull. I want the answer to the helicopters and the medics that took Rick away (especially since the end of the first Season saw the CDC and Government fall, and FTWD showed that the whole world was affected.) And why was Rick singled out? How did they know he existed? Are the people in the woods somehow connected? Or is that something else entirely? They seem to be getting bogged down in the trivia of running a community. Oh yeah, that I do agree. He definitely is in the route to become knight. Will he gain those chivalrous values is the question. And will he care about them at the end? And why was Rick singled out? How did they know he existed? Those will get answered in the movies. We don't really know what happened to him or why Jadis the trash queen was present in the DC area. Now that they have reached that point, I find it a bit dull. It is politics instead of warfare, and that is going to be very dull. I feel the same way, and mostly because they're not explaining the politics or follow things around them even though they could have done so. Instead all of it feels a bit disconnected. It is easier to understand what is happening in the GoT then this, but at least thing are progressing and not being stuck in the endless cycle of death and hatred. Like you I would have appriciated if they had put a serious effort on showing how one can survive and prosper amongst all those dead. Instead of that we get all these lose threads that mean nothing at the moment. It's like they've given us a punch of McGuffin's instead of solid progression that we saw in the Fear. Too bad Fear is still the better series. 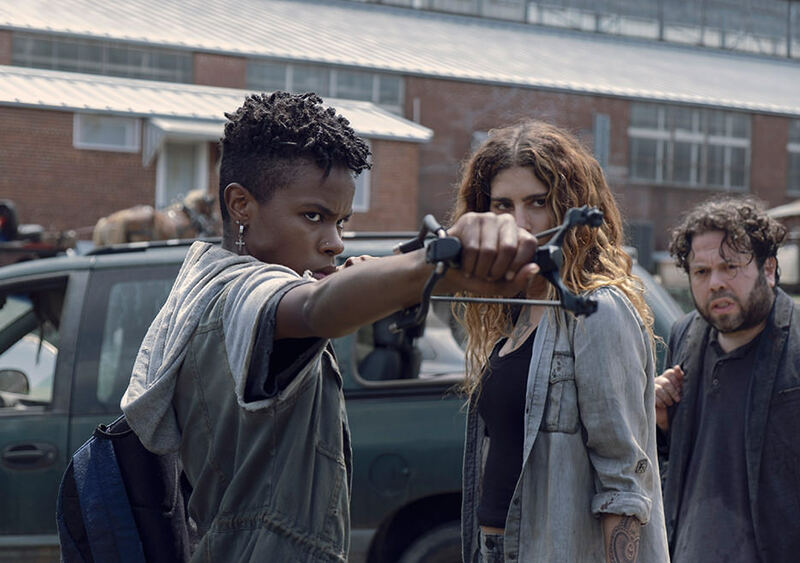 I think the rift between Michonne and Maggie may have something to do with Michonne blaming Maggie for Rick's 'death'. Maggie's actions did set in motion the events that lead to his apparent demise on the bridge. Was that C.Thomas Howel appearing as the messenger from hilltop? I also wonder is Daryl's naming of the dog a pop culture reference to an old John Wayne movie called Big Jake where the Duke had a mutt called 'Dog'. I am also finding Henry a bit annoying and slightly stupid by the looks of it. The newcomers are interesting and I like them. Did Carol trap Dog to draw Daryl and Henry together? No doubt she was covering both her friend and her "son" with her drawn bow, but what about poor Dog? She would have needed to make a choice if things had taken an even slightly more nasty turn. Henry? Definitely. Daryl, maybe. Dog, probably not. This episode was not bad. One of the weaker ones of this season but still solid compared to recent years and had some bits of action. There were some close calls for various animals and Daryl, but no escape for the violin. The isolation of these fairly close communities seems extremely odd. Also it shows how few survivors there are if no folks have come scouting from large communities in all those years. Good to see that next week there is some new zombie scares coming. I think will take over from the farming simulation. Should be fun. “I knew my buddy was in town and half jokingly, I said ‘Hey, I got somebody who could do it.’ Our producer Tom Luse said, ‘Who?’ He said he’ll check with [showrunner] Angela [Kang], and that if it all works out, bring him in,” Cudlitz said. Howell, who also appeared in The Amazing Spider-Man and Marvel-Netflix’s The Punisher, had just one condition for the cameo: the potential for a recurring role. It is possible but how could she has done that and taken the dog far away from his owner without Daryl noticing it? The isolation of these fairly close communities seems extremely odd. Also it shows how few survivors there are if no folks have come scouting from large communities in all those years. I think it's artificial isolation, meaning that it is done by their feelings rather than the reality. In the last episode Rosita and Dr Evil managed to make it all the way to the Water Towers in a single session, and this one it took them almost full day to reach the Hilltop with a detour to new comers camp. I believe it will all be fixed very soon. Also nobody has explained how come Daryl has fuel for his bike and the rest are using horses. The zombie virus on The Walking Dead is exclusive to humans, a detail which can be justified through science. "Some viruses are very species-specific," Tara Smith, a microbiologist and infectious disease epidemiologist at Kent State University in Ohio, told LoveScience. "For example, measles and small pox, humans seem to be the only host for those, they don't jump species." While this virus is human specific and cannot plague other species, not all viruses can only be carried by one species. "One of the ways we think Ebola may have spread into people, especially the 2014 West African people, was contact with bats or potentially eating bats, we're not 100 percent sure," Smith said. "Either way, bats seem to be the reservoir, but they don't seem to be affected by it. It's not symptomatic in them, but it causes huge symptoms in humans." For that reason, Smith suggests humans "try to minimize time spent in close contact with [their] animals," especially in worlds like The Walking Dead's. While Daryl's new dog is not affected by The Walking Dead virus, nor are the pigs from the prison days, it could have been possible for select species of animals to be affected while others remain immune. "Some flu viruses can affect a broad range of species, and we saw that with H1N1 outbreak in 2009," Smith said. "So, whatever it is, it still seems to be human specific, otherwise you would expect to see zombie animals." There is a scientific breakdown which can be simplified for the average person to understand why the zombie virus (or real life viruses) work in such ways in regards to being species exclusive. "Viruses typically have a tropism — that means they can only bind to certain types of cells," Smith said. "Sometimes the protein they have that would bind to cells might be ubiquitous to all animals or all mammalian species, or it can be really specific." It seemed like Dog was too smart to fall prey to the traps Daryl set for game and walkers; plus Carol is smart enough to outwit Daryl, especially if motivated by concern for a loved one. I wonder why Carol is so bent on transferring custody of Henry to Daryl. What is she planning? Is that woman serious? There is no science that can explain how an upper torso can survive on a stick, or a man with no abdomen can still walk. There is no need to try to do this. We gave up trying years ago here. The premise makes no sense. It is pure fantasy. This was a great one. I get why Michonne would not be cool with Maggie, Maggie was responsible for Ricks death. I think Daryl has overwhelming guilt for his part and does not know how to deal with it, so he is off on his own. To me they are equally as smart, but Carol is out of those two more motivated one to do what needs to be done. It might be that Dog (Not God from the Preacher) really fell for Carol's good deeds, but even then, why tie him down to place where Walkers get her. How did she know that Henry was going to follow Daryl and save his life at crucial moment? How did she knew that Daryl was going to be there at right moment to save dog and kindle with the boy? To me there was too much of random in the play for it to work exactly as it did. She was also surprised that Henry saved the gruffy man from trouble and not stood back as they'd thought him. Yes, she is. We have had these viruses going for hundreds of thousands of years. Some of them has passed the species cap, but most of them play by the rules and stick to one species instead of doing a full spectrum infestation. It is very unfortunate that Ebola, or N1H2 has passed to us, but in the other hand we went there and invaded their world. Normally what the animals get, we don't and what we get, we don't pass it to the animals ... or we do but it doesn't affect them the same way. That is basically what she is saying. I think Daryl has overwhelming guilt for his part and does not know how to deal with it, so he is off on his own. For six years? What sort of man plays by the grief rules for that length of time? I think he said it was easier to stay out there than go back. Not getting over it, as he is sitting there wallowing in it, I get it. I think some people sink into depression and stay there for years. with out pills they can not snap out of it. I also think that Carol is throwing a line, a way back to Daryl with the kid. I do get isolation, and I understand depression. I personally suffer from bipolar, where in bad days I just want to end all of it. But, the thing is, at least to me, is to not give up and just push through even if you don't want to. Just think about the Dog, if he doesn't do what Dog needs him to do, Dog will whine and remind him that there's things that need to be done, that there is routine. To the depressed people the routine might be the thing they want to avoid. Like for example, there might be days when you don't want to get out from the bed, and you'll do everything to stay there. But if there's things that needs to be done, no luck there bro. So, people are depressed and do things, but for Daryl it's like he has been depressed since he encountered first walker and it stole his squirrels. In Daryl's case there might have been a quick end to the said walker, but he would still have moped out looking like a proper asbo. Still, not going anywhere and not doing anything, it's not his MO. He will do it even if he doesn't don't want to do it, just because it needs to be done. The happiest I've seen him was when he was out with Aaron, scouting for new comers and in a couple of bro trips with Rick. That's what I think. Maybe AMC will reveal more about what he's been doing for six years.